Description : Superb rare authentic dual signed 12oz Everlast glove, signed by both future HOF'ers Oscar De La Hoya & Bernard "Executioner" Hopkins....... De La Hoya fought Bernard Hopkins (44-2-1) in mega unification match on September 18, 2004 at the MGM GRAND Garden Arena in Las Vegas. Hopkins held the WBC, WBA, and IBF middleweight titles, was recognized as Lineal and The Ring champion, and was considered by many to be the number one pound for pound fighter in the world. Although the fight was at a catchweight of 158 pounds, 2 pounds under the Middleweight 160 LB limit to compensate for De La Hoya moving up in weight to challenge Hopkins on a supposed equal weight basis. 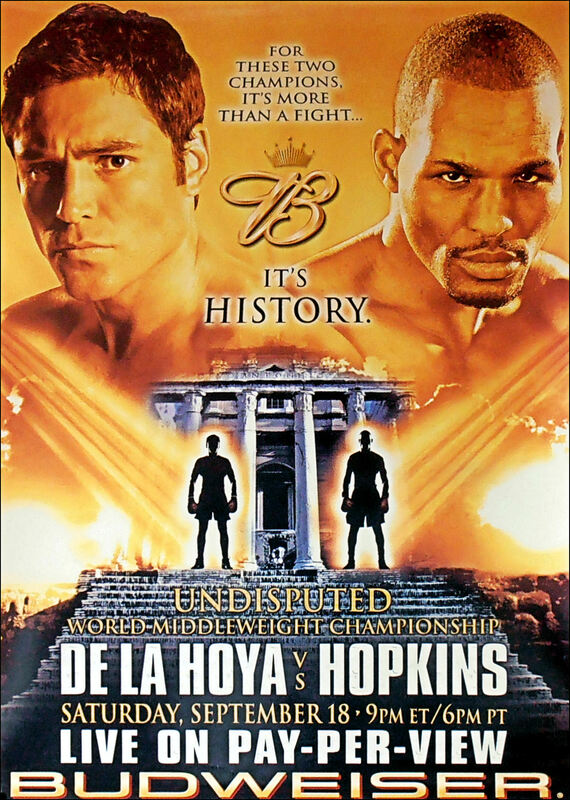 Many thought De La Hoya was too small for the weight class and Hopkins was considered a heavy odds-on favorite........De La Hoya fought a good tactical fight, the fight was competitive. After eight rounds, De La Hoya was ahead 77-75 on one scorecard, but was down 78-74 and 79-73 on the other two scorecards. 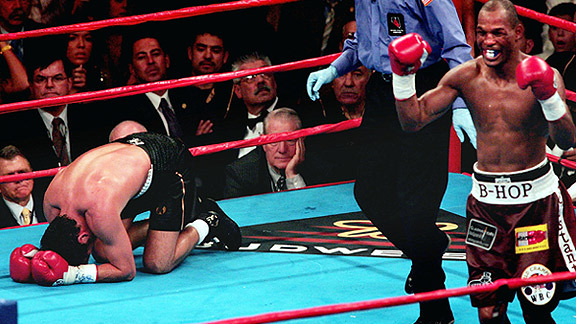 In the ninth round, Hopkins knocked out De La Hoya with a left hook to the body, the shot was a gem, perfectly placed under the floating rib & there was nothing Oscar could do about it, he was down, in agony as his diaphragm seized up, couldn't breath, pounding the canvas with his gloved hand out of frustration as the count reached the fateful 10. 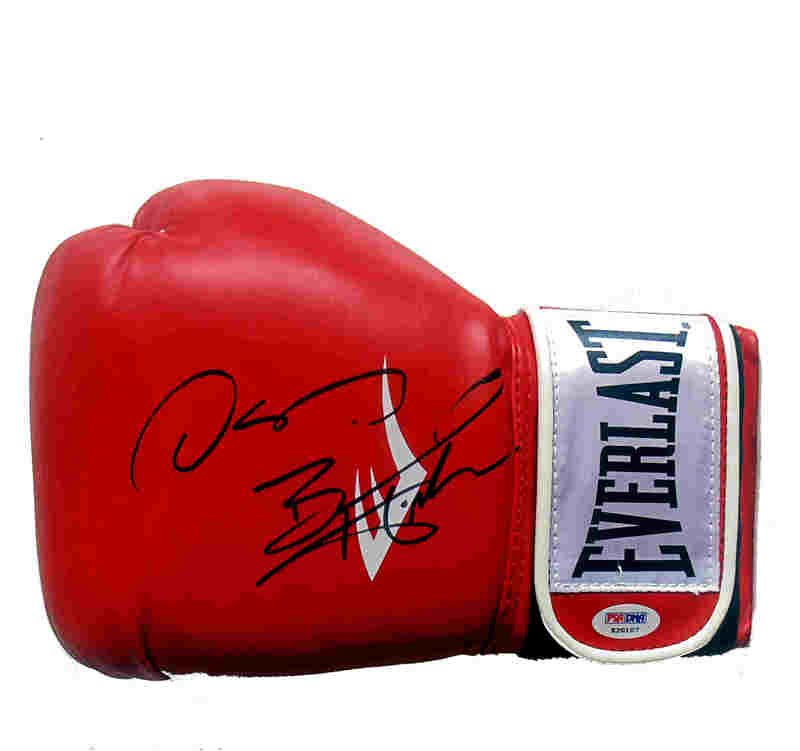 It was the first time in De La Hoya's career that he was knocked out........Comes with a LOA lifetime guarantee & beyond from KOfightposters.com & a cert of authentication from PSA/DNA.